Day 3 No Bread, But Who Misses It? How many days can Denise go with out bread in the house? I think I could let this theme roll on for weeks. In case you are concerned I did pick up a loaf today, but not until after school. Our school is on a five day break, so I won't be packing bentos until next week. I may have a few alternative posts up my sleeve, so stay tuned. Yesterday, I picked up my daughter from school and we had a leisure lunch at the grocery store. We then decided it was the best time to do some shopping. Apparently I didn't walk down the bread aisle because it wasn't until this morning that I realized, I forgot the bread. Our grocery store has just gone under a major renovation, so I am still getting used to where everything is. Lucky for Sj my husband made pancakes for breakfast this morning, so she's going to have a pancake peanut butter and jelly for her sandwich. Oops. Maybe breakfast for lunch will be a regular theme at Colorado Bento. This may have to go down as the laziest lunch I've ever packed. I haven't been grocery shopping yet for the week, so sometimes I have to get creative. Although this lunch is not my ideal, I think it's important to show those days when I am not feeling on top of my lunch packing A-game! I hope you agree. I had a left over piece of french toast from breakfast yesterday, so I cut it in half and put some peanut butter on it and drizzled a bit of maple syrup inside. I decided to forgo any vegetables today because it just wasn't a vegetable friendly lunch. I thought bell peppers would just be too icky with this, so I kept it to fruits. We are starting our third week of school and I've been documenting my lunch packing process over at Colorado Bento! 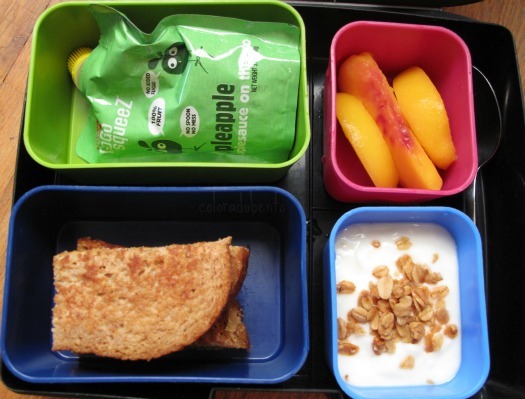 If you need some inspiration or just want to see how easy it is to pack waste free lunches, click on over. Some of you already know this little tidbit about me and some of you may be surprised by what I am going to confess. It's not quite a deep dark secret, but rather a little odd. I love the digital world, the convenience of my devices, keeping up with new applications, and maintaining a connection to the constant evolution of the technologically based world we live in. Ah heck, let's just say I love the digital age. My daughter requested macaroni and cheese this morning, but it was taking forever for the water to boil, so I went with a whole wheat cheese quesadilla instead. 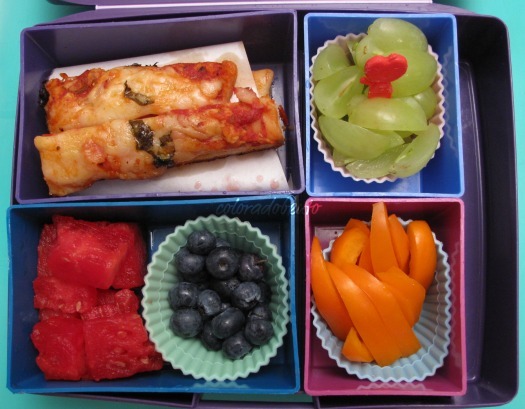 I put the quesadilla in a separate bento since it's warm (or warmer than the fruit and vegetables). This is what a bento looks like when I clearly need to go grocery shopping. I could possibly squeak out one more lunch, but I need to get some fruit. Our garden helped add the red to the mix today, thank you tomato season. One of the best finds I ever made for making lunch packing fun and easy are Japanese Floral Vegetable Cutters. I have two sets and they easily cut through vegetables like carrots. They are deeper and made of a sturdier metal than just regular cookie cutters. I love using my mini-cupcake silicone cups for panda, they were perfectly for the top layer. Today I was successful meeting my fresh fruit and vegetable standard! 3 Vegetables, 1 fruit, 1 fruit strip (made from 100% fruit). Whole Wheat bread, Applegate turkey, sharp cheddar cheese, cut with cookie cutter Vegetable straws Cherry Tomatoes Carrots, green grapes, cucumbers Mystery item in the corner? Fruit strips cut into flowers (dessert). There have been reports lately from organizations that the United States has a honey smuggling problem, in some cases it's even referred to as honey laundering. What a crazy thought, smuggling honey into the United States? 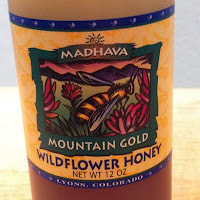 The honey at the center of this debate is stemming from Asia, in particular China and India. Asian honey is banned in the European Union and we need to stay abreast with EU bans because they actually enact laws that protect citizens over corporations. Problems With The Smuggled Honey? Apparently the FDA is turning their backs on the majority of honey that is entering the United States. Approximately 200 million pounds of honey was imported to the US in the last 18 months, but only 50 million pounds of that was reported to be from trusted sources from Canada to South America. So where is the other 150 million pounds coming from? Asia. I have a thing for fruits and vegetables, on top of that I love for a lunch to be filled with a wide range of colors. If I look in a packed lunch and see too many things of one color or lacking color (palette of brown for example) that makes me nervous. I've said it before, I always try to pack a combination of three fruits and/or vegetables. The grain or carbs are just secondary in my mind. If I see a rainbow, I feel content. I'd have to admit, that's close to a perfect lunch for me. Although, one more vegetable would make it perfect! It was just a few short moments before we were headed out the door when I looked down at my daughter. She had two well manicured braids in her hair, a new striped dress complete with a name tag (which she luckily reminded me of), her Yo Gabba Gabba Vans, and socks up to the middle of her calves, when I realized she didn't have a backpack. I mean she does have a backpack, handed down from her sister, and a goofy Dora backpack that's "super babyish" now. But today was her first day of school, her last year of preschool, and I guess I spaced getting her a backpack to call her very own. I mean she takes a bottle of water and a hat to school, does she really need a backpack? Credit due to my husband who lets me sleep in a bit longer, sometimes I wake to find lunch already packed. He doesn't cut off the crust or use cookie cutters to make cutesy shaped sandwiches. Honestly, she eats it just as well. I wouldn't send an applesauce in lunch, but I am sure Sj demanded it (they were purchased the night before). We love those applesauce pouches. Overall well done, I'm giving him his own label (see Josh)! Currently there is a huge debate in Douglas County over their new school voucher program. I believe they have replaced the word voucher with scholarship, to soften the blow in discussions. My biggest gripe with the word scholarship being used to replaced voucher, is that a scholarship generally comes with the assumption that money is awarded based on academic achievement or financial need that is funded privately by a foundation or trust NOT with public tax dollars. Unfortunately, as I understand it in Douglas County, their vouchers are given out simply by application from a family to a school that is "approved" from their list. School vouchers are something I don't take lightly and I definitely have an opinion on the matter. I don't typically use Eat Play Love as a platform for such issues, but I think my opinion deserves a forum because I am very passionate about education. 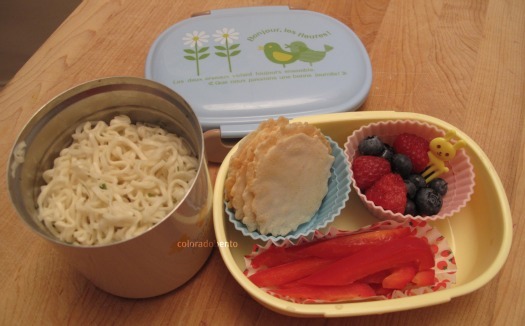 I love sending foods in my daughter's lunch that would surprise her, in a good way of course. Ramen noodles are fun and slurpy, so I decided to send them today. I didn't send much liquid, just a bit to keep them moist, as Sj rarely drinks her soup broth. The brand of ramen we buy uses organic noodles and there is no MSG or preservatives in the spice packet. We don't purchase any foods that contain MSG. I try to always pack 3 fruits and/or vegetables in what ever combination that I have on hand. Koyo Asian Vegetable Ramen with organic noodles 35 Degrees Crispbread (a Denver Company) Strawberries, raspberries, red bell pepper. Star sandwiches cut with a cookie cutter. Applegate Ham, cheese, Rudi's WW bread. Organic corn and edamame. Zucchini Bread two bites. Watermelon stars, champagne grapes. 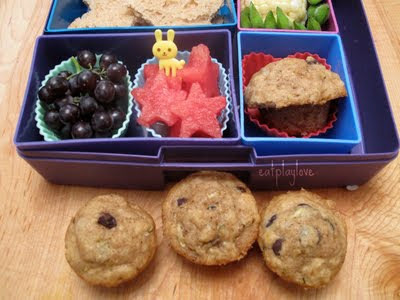 I created this recipe for a lunchbox treat contest. We love it, especially with the abundance of zucchini we have right now! Enjoy. Makes 2 loaves, 24 muffins, 24 mini muffins & 1 loaf, or a combination. Preheat oven to 350 degrees. Grease pans. In a large bowl combine sugar, vegetable oil, eggs, grated zucchini, and ginger. User tip, I grate my ginger with a Microplane. Mix until combined. I entered this recipe into a contest for a special lunchbox treat. I'm a huge fan of adding non-traditional spices to baked goods, the surprise of wonderful flavors makes my family happy. I hope you enjoy this recipe, especially if you have zucchini coming out your ears right now! I promised Sj last night I would pack Onigiri for her lunch today. Onigiri is very easy to make, just whip up a batch of sushi rice, cut up a sheet of nori that you would typically use for sushi rolls, fill a bowl with warm water and salt for your hands (otherwise the rice will stick to you), grab a handful of rice and form into a triangle or any shape you like. Below is a bunny from a rice mold I own. I then add the nori to the outside, if the rice is warm, it just stays in place perfectly. Traditionally Onigiri is made with filling such as salmon or tuna, but these are just plain rice. Please excuse my pitiful bunny face, it's comical, isn't it? I've never been able to find a nori punch that creates faces to decorate Onigiri. Let's just say, it's very difficult to cut Nori into little circles. I'm learning. The leftover rice will be used tonight for a homemade sushi roll dinner. I'm going to come straight out and say some harsh things about the state of our food system. Some of you may read this and agree with me straight out, some of you may think about what I am saying and possibly gain a new perspective, and others will simply delete this post. No matter where you fall in that spectrum I do need to clarify, I have always written Tuesday Tips from a place of integrity. More times than not they are written because I care a little too much. Tuesday Tips started because I wanted to share insight into how I live my life, I'm a bit more grounded in a non-traditional lifestyle and people started asking for my advice on products I use or how I do things. I'm simply sharing a different way. I consistently try to encourage others to use leftovers for the lunch they pack. If you think about it, the food is ready to go and it's just an extension of the way you like your children to eat at home. In my book that's perfect and makes the morning lunch packing go so much faster. 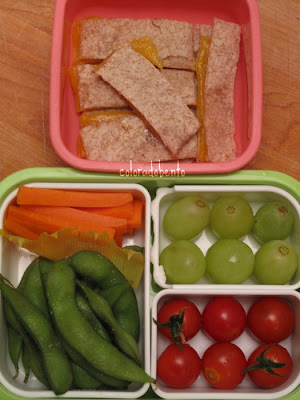 All this bento needs is a red and white checkered tablecloth. --------------------------------------- Do you want to read Colorado Bento when it's updated? Simply click on the reader button, email, or Google Connect on the right sidebar! 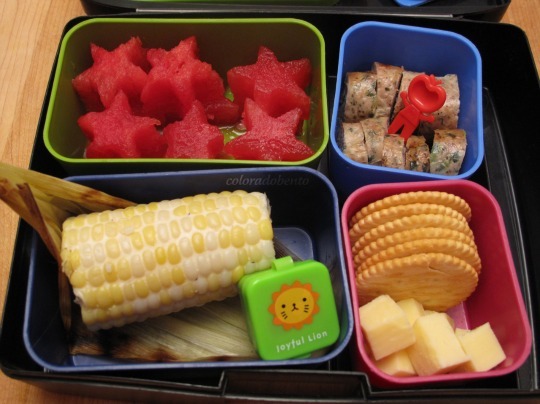 Back To School, Bento Day 1! This morning I was half asleep in bed when I heard Sj casually say to me, "Mom wake up before Dad makes me a boring old lunch." I laughed thinking, this is the life of a soon to be eight year old, with a mom who loves packing lunch. Now, let me defend my husband, he lets me sleep in, he makes breakfast, he packs lunch, with no complaints! But there's a little nugget of wisdom in my daughter's request this morning. I LOVE packing lunch, especially if my refrigerator is freshly stocked with plenty of options. 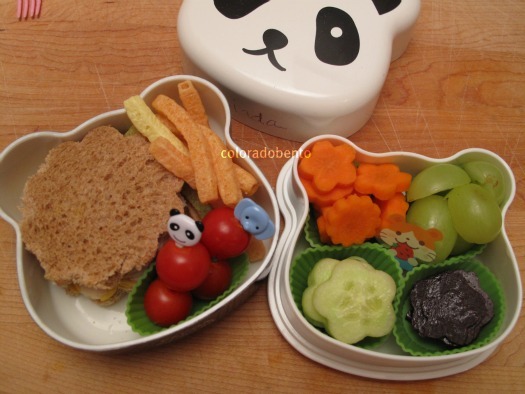 I love fitting everything just perfectly into a bento, cutting fruit into new shapes, figuring out what vegetables and fruits would compliment the flavors in her sandwich. My husband, he gets the job done and apparently there's a noticeable difference. 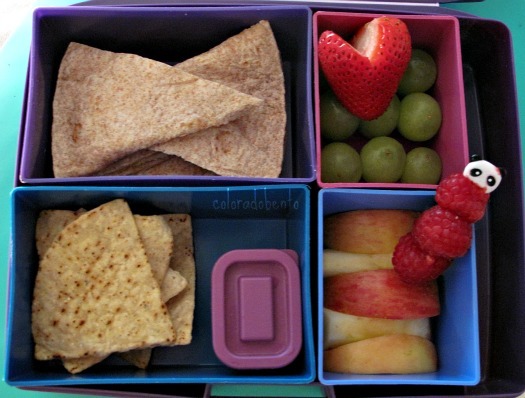 If you think of lunch packing as a burden, just another thing "I HAVE TO DO", then your lunches will bear that sentiment. Many of us pack lunch five days a week, just embrace it, it's not going away. This weekend was the Grand Re-Opening of the Boulder Whole Foods Market on Pearl Street. It is with great pleasure that I am able to share the wonderful news, that the store is finally done, and it looks amazing! From here on out when you visit the store the items will be in the exact location they were in the last time you visited (a round of applause for those of us that stuck it out during the construction). The remodel and expansion have been ongoing for the past year. The formerly 39,000 sqft store is now approximately 66,000 sqft, not including the 10,000 sqft neighboring Whole Foods Liquor store that sits on the east side of the market. Which also means, Boulder is now home to the largest Whole Foods in Colorado! 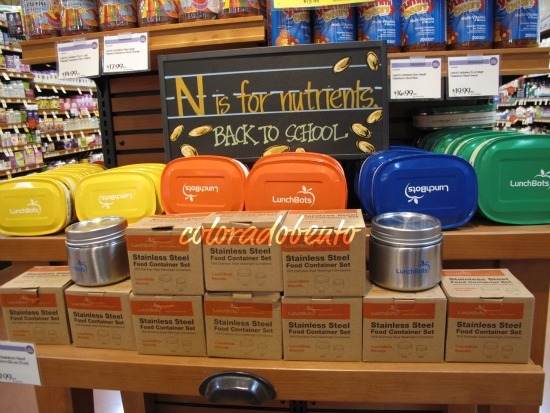 While out shopping today and enjoying the Grand RE-Opening at the Whole Foods Market on Pearl Street in Boulder, I took a moment to snap a few shots of their lunchbox selection. They have some great alternatives. I understand it's hard to make a special trip, only to find they didn't quite have what you had in mind, so hopefully you'll see exactly what you are looking below. The great news is that Whole Foods carries a very safe line of lunch box alternatives. All boxes are BPA free and the Crocodile Creek as well as Laptop Lunch bags are Lead Free. Lunchbots: Stainless steel bentos including stainless steel lid, lids are powdered coated in different colors which help differentiate the size. They also carry the Lunchbots stainless steel liquid food containers, they appear to seal tightly. I do not own any Lunchbots, so I don't have an opinion about them either way. 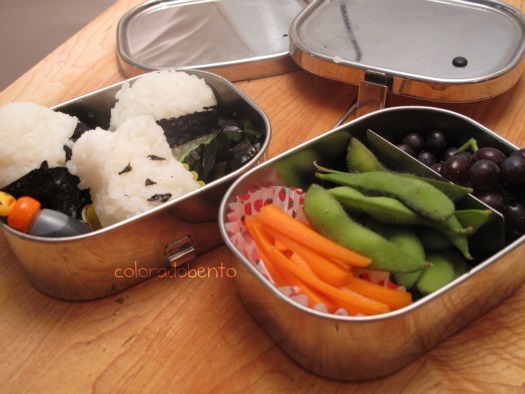 If you are looking for a stainless steel bento, this is a great route to take. Four years ago today, I hit publish and this blog was born. It was probably one of the only times I was so scared and nervous, I had no idea what I was doing, nor did I know what exactly I was in for. I naively picked a whimsical name for this space, I admit I love the way it sounded and there was an available gmail account. I wonder how many blogs were born out of the availability of the corresponding gmail account. Laugh. Four years later and the three words Eat Play Love absolutely define my online identity. Realistically speaking, if I could have a do over, I wouldn't change a thing. I embrace the beauty of those three words and how they make my life so much better. This blog has brought so much goodness into my life in the past four years. There's a fine balance between writing down every last item you are going to pack inside a bento for the week and winging it in the morning. Here's a list of items that I must keep stocked in my pantry ONLY as a back up, in case I am running low on fresh ingredients which are always my first go to. In our home, I feel like we are always out of bread, so I make sure my backups are in stock, all the time! Any fruit in 100% juice, not corn syrup. I don't stock mandarin oranges that are sourced from Asia. I try to avoid foreign grown canned fruit. Serve as a great bread alternative, my girls prefer the "light rye" over other dense types. Probably the most labor intensive lunch I make, but it is faster than going to the store. You choose the lesser of two evils when you're tired on a Thursday am. 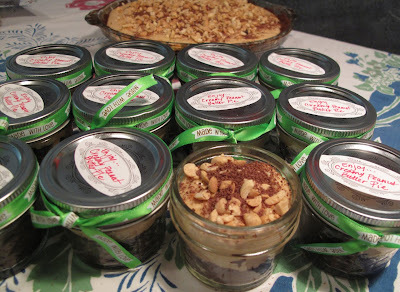 I'm Asking For The Sweetest Favor Ever... Make a Pie With Me On Friday? At this point I am sure the saying is beyond cliche, but Twitter is my water cooler. I enjoy spending the days with my girls, but sometimes I need some adult conversation. I crave interaction and Twitter comfortably fills the void for me. I've seen circles form, bonds strengthen, and friendships flourish all within the constraints of 140 characters or less, all within the sea of millions. Sometimes you find out you share a homemade Pizza Friday tradition with one of your friends on Twitter, sometimes you discover you both had to go on heavy meds for a severe reaction to Poison Ivy, and it wouldn't be crazy to learn you both grew up a few towns away from each other in Upstate New York. Which is just a few reasons why, Twitter is my happy place. As it turns out, this story has two parts. But the first part involves a pretty itchy and gnarly looking rash, so for the moment, I'm cutting straight to part two. I was put on prescription medication for the aforementioned rash and well, it turns out the side effects were endless amounts of energy! Woo-hoo, hop on board the prescription drug train... I have said this and I will happily repeat it, if the prescription I was given did not have such awful side effects for long term use, I may have been interested in seeking out alternative methods of procuring these magical white pills. I must confess, I'm not much of a Doctor or prescription person (haven't been on one since giving birth almost 5 years ago) so I decided to ride the wave while it lasted. Where was I going with this? I know my story was much deeper than magical rash-be-gone white pills, that I'm currently tapering off of. Ah yes, the rash, the energy, the change. 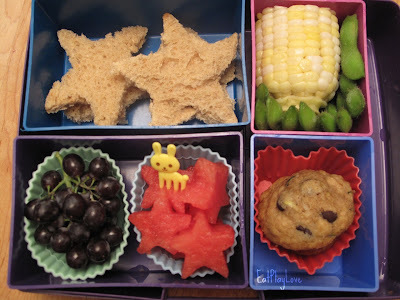 Back To School Bento Guide With Photos! 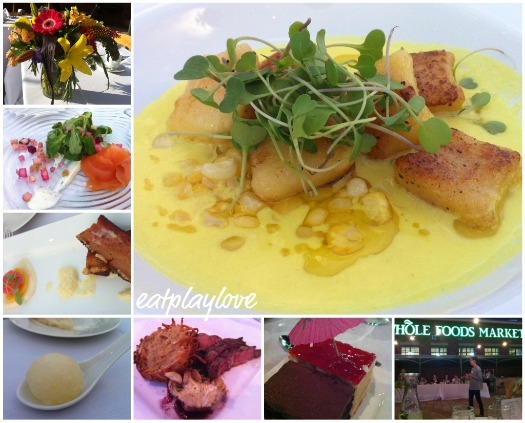 If you arrived here for the first time via Eat Play Love, WELCOME! 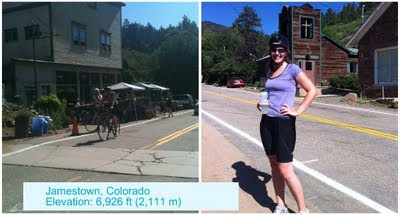 I've taken summer off, but this blog will now be updated regularly. School starts in a couple of weeks, so I will share how we are preparing for back to school and diving head on back into lunch packing. I first put my hands on a bento box from Japan a little over 4 years ago. My husband returned from a business trip with one as a gift for our daughter, who at the time was in preschool. Within the next year, when he returned to Japan, I handed him a list of must have bento supplies for him to seek out. Luckily for most of you reading this, bentos are continuing to become much more mainstream and finding them online now is easy. 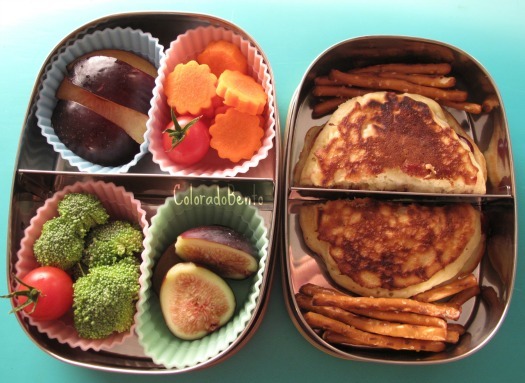 Packing bento style lunches changed our lives. 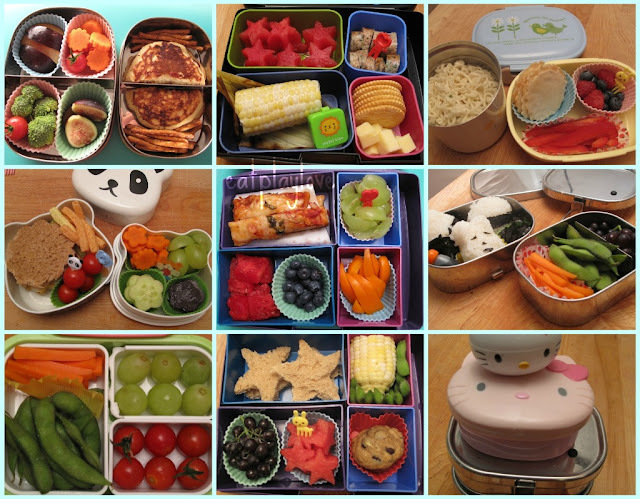 My goal is simply to share what type of bento boxes I use every single day.